Hardware Lane. It's a bit like the Lygon St tourist strip but for locals. Business workers inevitably wander through there in office hours, and during the day many of them sit down for steak/burger/focaccia and chips and, if their company is that way inclined, a wine or beer. Even when you're using it as a thoroughfare between Lonsdale and Little Bourke St, alone, clearly distracted and not by food, the spruikers endeavour to lure you in. Having finished Happy Hour at Word Bar, however, Hardware Lane's proximity could not be ignored. We settled on a Thai dinner at Aloi Na, whose menu both comforted and disturbed me. Everything seemed extremely well-priced: a relief since it meant I could order more liberally, but also a concern, since we were in the dead middle of town and I expected to be overcharged. 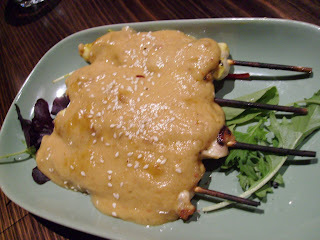 We started with chicken satay sticks. I was hungry enough that when they arrived they didn't appear quite so sickly as they do in this photo! The satay sauce was acceptable: very creamy, and unctuous. The chicken was far too dry, however. Looking back on what we ordered, chicken was a prolific ingredient and the dryness featured throughout the meal. 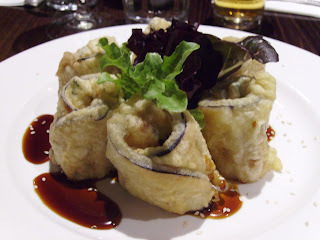 Our second starter was tempura vegetables. Lovely presentation, and a nice light tempura batter. The curled eggplant wrapped around carrot and zucchini. The vegetables were a little bland, but the soy dipping sauce lifted the flavour. I was particularly torn ordering my main. The restaurant offers a red duck curry for just $18.90. It met my craving, but what could I truly expect from such a dish at such a price? I went for the more generic green chicken curry. The clay pot actually came sat over a tea candle - another nice presentation feature. 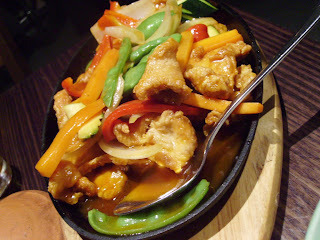 This dish had the best chicken of the night and generous pieces of zucchini, capsicum and carrot. 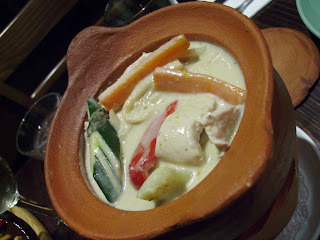 The green curry sauce was, again, sufficient, but had no subtlety of spice to really lift it to a memorable dish. Aesthetics seem important at this establishment. 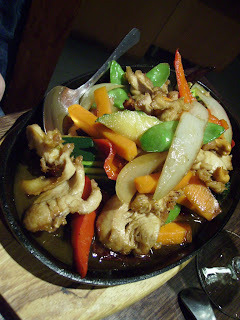 The chicken and cashew stir fry looks sensational: The chicken was dry and the sauce somewhat salty, however. The vegetables, on the other hand, were crisp and fresh and added a lot to the dish. Similar reports came from the sweet and sour chicken. Nice colours again, and I like the battered chicken mixed in amongst the vegetables and sauce. The vegetables were the winner out of this dish, as well. It is good to know that one can eat at a reasonable price amongst the schmaltz of Hardware Lane. The noodle dishes at Aloi Na, for example, are mainly around $13. The quality is about as exciting as the serving staff, however, who looked surprised every time they arrived at our table with a bowl of food. The restaurant also offers a modest, predictable and cheap selection of wines by the glass, as well as Chang beer for $6. we like your blog. we will be reading it avidly before our trip to melbourne. Hi Feehsh. Thanks for your comment. Hope you find some inspiration here for places to eat (and things to read on the plane!) next time you're in town.